This post is part of KQED’s Do Now U project. Do Now U is a biweekly activity for students and the public to engage and respond to current issues using social media. Do Now U aims to build civic engagement and digital literacy for learners of all ages. This post was developed by Collin Grayless, Aryn Long Suiter, Mariah Rodriguez and Robert Jackson, students in James Speer’s “Introduction to Environmental Sciences” class at Indiana State University. 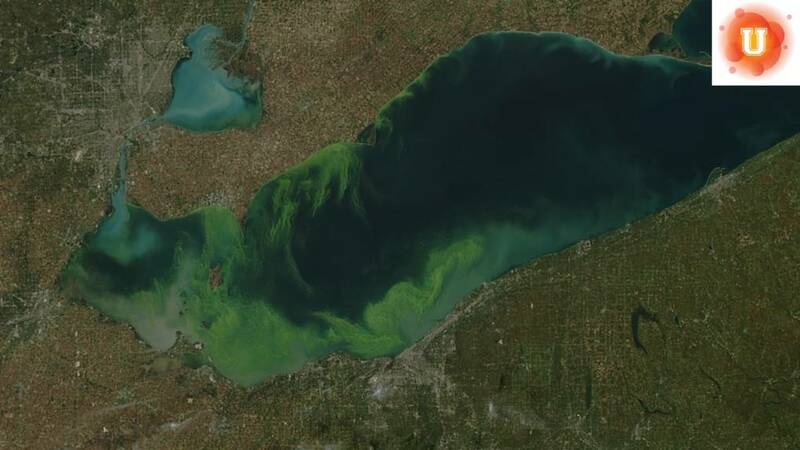 This report from 2014 discusses the pollution of Toledo, Ohio’s drinking water and steps that farmers have been taking to reduce fertilizer runoff into Lake Erie. To respond to the Do Now U, you can comment below or post your response on Twitter. Just be sure to include #DoNowUFertilizer and @KQEDedspace in your posts. Fertilizers have been used in agriculture since the beginning of domestication when animal manure was used to enrich the organic matter in soils. In the modern day, farmers use artificially produced fertilizer such as nitrogen, phosphorous, and potassium to increase growth and yield of their plants. Fertilizers can provide a benefit, but they can also contaminate freshwater and damage an area’s ecosystems. Nitrogen is a key element in fertilizer and provides necessary nutrients that encourage plant growth and increase yields. However, high concentrations contaminate surface and groundwater supplies. Phosphorus is naturally found in mineral deposits, but overuse causes an imbalance and creates water pollution. These three elements are also responsible for eutrophication in bodies of water. This is a process in which excess nutrients cause rapid growth of algae. As a result, the water turns green and becomes cloudy. As the algae die and decompose, the water is depleted of oxygen for fish and other species. Because this is nonpoint source pollution, meaning that it comes from the broad landscape rather than an identifiable source like a pipe or smokestack, it is harder to keep track of and especially hard to regulate and reduce. Fertilizer provides the elements that the plants use in order to make them grow faster, better, and healthier. Fertilizers are merely nutrients applied to cultivated fields to increase required elements found naturally in the soil. The use of fertilizer has permitted farmers to continuously attain rich harvests on the same land for years, thus reducing the need for clearing new lands. If farmland is overused from growing too many crops year after year without a chance for the soil to lay fallow and rest, the soils can become depleted of nutrients. This would potentially require farmers to move to new areas, which could result in clearing a new area of land. In this case, this also would leave the prior cropland bare and exposed to erosion. Other benefits of fertilizers are that they can increase the aesthetics of yards, golf courses, and other landscaped areas by making them fuller and greener. Proponents of fertilizer use say that it is necessary for our agricultural system and should not be regulated because if farmers put too little fertilizer on their crops, their yields could be greatly reduced or they could lose their crops all together. On the other hand, fertilizers are expensive and often over-applied. By using less of it on their crops, farmers could save money, which would be good for the ecosystem as well. Overuse of fertilizer results in eutrophication of local ponds and dead zones. Dead zones are low-oxygen areas in lakes and oceans where little life exists. There are more than 400 dead zones worldwide, equaling more than 94,000 square miles of ocean. The dead zone in the Gulf of Mexico is roughly the size of New Jersey, and it continues to grow. Another harmful effect of the algal blooms due to fertilizer runoff is that the algae covers the surface of the water making it harder for sunlight to penetrate and reducing the ability of underwater plants to perform photosynthesis. A few species of algae are known to produce toxins that can kill fish, birds and mammals, which can potentially cause health problems for humans when we eat those animals. In addition, these toxins, as well as excess nutrients from fertilizers, can contaminate drinking water supplies. Proponents of government regulation of artificial fertilizer use say the damage outweighs the gains and rules are necessary to reduce the effects of pollution throughout the United States. There are also alternatives to using artificial fertilizers, such as returning to organic farming and even pursuing permaculture, which can produce high yields of edible foods on smaller areas of land. What do you think? Are the benefits of using fertilizer on crops and landscapes worth the negative effects on ecosystems? Should the government restrict fertilizer use to improve the water quality of lakes and coastal areas? Learn how scientists tested streams for pesticides and fertilizers, and to see how they may be affecting aquatic life. Read how lawn fertilizer affects groundwater, our water supply and the environment. Learn about the process of eutrophication with this short animation. I agree with a lot of what you are saying. While I think we need to look at all options available to cut back on environmental damages, the scenarios you listed are smart and adequate scenarios. Your suggestions are ones that I can agree with, and ones that seem as though they could become a possibility in the future. The one area where I disagree with you, is that I believe we need to look at ALL of our options that will reduce water and environmental damage, including possibly cutting the use of these dangerous products until they are improved. However, overall I agree with you and appreciate your propositions, as well as your ability to find a post to comment on. I disagree, as the negative impacts of fertilizer use on the environment far outweigh any economic benefit to farmers and society as a whole. While in the short term regulations on fertilizers may affect food markets, organic farming is already more profitable than farming that relies heavily on the use of fertilizers, according to the Washington Post https://www.washingtonpost.com/lifestyle/food/is-organic-agriculture-really-better-for-the-environment/2016/05/14/e9996dce-17be-11e6-924d-838753295f9a_story.html?utm_term=.6d833ba96b90. So, not only are there little economic benefits to farmers, but organic farming has the potential for greater profits, and environmentally would be much safer and socially beneficial than large-scale use of fertilizers. It’s important to note in the KQED article that entire aquatic ecosystems have been turned into “dead zones” some spanning nearly the entire area of the Gulf of Mexico. I believe, that while it plays a key role in one of America’s most important and dominant industries, fertilizer poses such a list of environmental woes that some sort of regulation needs to be put into place. This could be done through more intelligent farming processes, more healthy and natural fertilizer options, government enforced farming regulations, or through a variety of other courses of action. Agriculture plays such a key role in California’s and America’s economy that it is hard to try and limit it in any way. However, considering all of the damaging effects that uncontrolled fertilizer can produce (including unhealthy running water, dangerous pesticides, erosion, dead zones where rivers meet the ocean, improper light filtration within water, and a continuous list of other negatives) it is hard to deny that something must change. I’m not saying we should eliminate the use of the product, but smarter and more more regulated use must be employed. The damage it does to water quality, as well as wetlands and areas surrounding water sources, is a clear message that something has to change. The US government should restrict fertilizer use to improve water quality, as there is ample scientific evidence and large scale examples of fertilizer use causing groundwater contamination, algae blooms in large bodies of water such as oceans and lakes, and organic farming is a clear alternative to fertilizer use. According to the University of Vermont, http://www.uvm.edu/~vlrs/doc/lawnfert.htm fertilizers often cause serious damage to ecosystems through surface runoff and contamination of groundwater, often threatening human populations. Considering that many regions rely off of groundwater reservoirs for their water supply, this also threatens humans on a large scale. Algae blooms are a second major justification for restrictions of fertilizers. As the KQED article points out, algae blooms can cause massive decay of aquatic ecosystems that lose oxygen and sunlight from algae blooms, some as large as the Gulf of Mexico. Organic farming is a major and already prevalent alternative to fertilizer use, so restricting fertilizer use would not cause a massive crisis in the food industry, or threaten our food supply in the long term. If anything, it would probably help because it would reduce contamination of water sources needed to sustain farmland and agriculture through the coming decades. To save water we need to reduce the use of fertilizer in the water. For this we request the government to take a step to stop this forever. I hope we find more better decision from here. I think that fertilizers need to be regulated because it can effect lakes that people swim in. if the lake is at the bottom of a hill near farm land the fertilizer will run off into the lake and cause bad things to happen to the wildlife in the lake as well as the people who swim in it being affected. I do feel like the Government should restrict it because we need to save as much of water we possibly can. I think that there definitely be a restriction on fertilizer to improve the water quality so that environments outside of fields do not get harmed. It can possibly harm our drinking water as well as other species that it can affect. reducing & saving water for reason of survival. If there is anything making a water supply worse then yes resrict it. I think that it is a good idea for fertilizer to be reduced. if it has a major negative effect something should be done to fix that. I personally believe the best route to take would be to limit fertilizer use. The safety of those ecosystems is far more important than producing a mass yield of crops, which only benefits humans rather than hundreds of species that may exist in those locations. Unfortunately, I find it hard to foresee any action taken by the government since farming is such a large industry and many individuals seem to value human lives over the well-being of the rest of the world. I think we should no longer fertilizer for our crops. I belive that the negative effects to our environment out way the positive effects. There are other ways that we could help crops grow that wouldn’t damage our environment or drinking water. #envi110 #donowufertilizer I believe that restricting fertilizer will harm field and grass by allowing pesticides hurt the greens that cover the earth. It’s important to bring up topics like this one so that people realize what our man-made products are doing to kill the environment. Yes the U.S. government should restrict fertilizer use to improve water quality. This is very important because our water quality is going down the drain, no pun intended. It is very important to keep a high water quality. I think the government should restrict the use of fertilizer. I think at this point there is enough research and evidence to support that argument that it is doing more harm to our water than what it is worth. As stated above, “Overuse of fertilizer results in eutrophication of local ponds and dead zones. Dead zones are low-oxygen areas in lakes and oceans where little life exists. There are more that 400 dead zones worldwide, equaling more than 94,000 square miles of ocean.” In my eyes this is unacceptable. I do think that fertilizer use should be reduced. However, I do not think it should be completely prohibited. Although fertilizer has negative effects on water quality, it has several other benefits on land. There are other ways to improve water quality so again, I do think the use of fertilizer should be reduced but not completely prohibited. Fertilizers shouldn’t be restricted, it needs to be used with precaution so that people don’t over use fertilizers and cause problems with the water. Yes if they see that the water can be dangerous and it is due to the fertilizer they have every right to control what fertilizer is being used if any. I agree. Far too often money or profit is put ahead of health and well being. The government is there to help “the people” so why haven’t they already done so? Leaving an area of environmentally impact as big as water pollution unregulated is just plane irresponsible. If there is something endangering the water that we drink and use on a daily basis I believe the government has every right to jump in and save the water from becoming poisonous. I think they have every right to start programs that they think are going to help and they can ban the use of fertilizer if they want and come up with another method of taking care of crops if they want to. I think keeping the water safe is more important and they can get rid of anything that can cause an issue. By removing so many crops there would be a small collapse in the United States Ag industry. That would put tons of farmers and laborers out of work. I agree that a solution needs to be found but getting rid of all the farm land first is not a step in the right direction. The state of United State agriculture demands farmers to use some sort of fertilizer to be able to produce competitive yields. That being said most farmers are currently using chemical fertilizers which have a greater impact on the environment. By returning to only using organic fertilizers farmers in the longterm will produce better crops and also have a positive impact on the environment. There needs to be a shift in how much pressure is put on each farmer. They are making pennies on the dollar and by using chemical fertilizers they are only trying to help put food on the table for their families. Most farmers that choose to go organic are already wealthy so they can afford to lose a few dollars in their initial years. Rather than punish farmers for taking the more environmentally friendly but instead reward them. There are certain products that can reduce the use of chemical fertilizers and that is where a sound government policy could be useful. Phosphorus run-off could be greatly reduced by the use of certain natural products that free blocked phosphorus from the clay particles in the soil. This way you substantially reduce the use of chemical P fertilizers and at the same time reduce water pollution and algae bloom. I believe that the U.S government should only restrict fertilizer use if they gather opinions from farmers, and how this will affect them. Jumping to cut fertilizer use could affect California’s growth output, and we export a lot of food to other countries who rely on our growing capability’s. Unfortunately, due to its size we arrive at the current situation. Its comparable to the over fishing of the oceans, if the demand is there the supply will follow. As time goes on science might solve this problem. #MyCMSTArgs #DoNowUFertilizer @2ndheartmom. I think fertilizers do need to be regulated. On one hand, it’s true that fertilizers help farmers to produce enough food to keep up with the enormous demand. However, we could still probably produce enough without it for ourselves. On the other hand (more importantly), it appears to have some very serious consequences for the environment. We should reduce using fertilizer if it’s going to potentially cause dead zones in our lakes and oceans. I don’t necessarily think we need to stop using them altogether though. The U.S. government should restrict fertilizer use to improve water quality because if they do, there can be a less chance that the water will get contaminated. The US government should restrict fertilizer use to improve water quality because It does more harm than it does good. Fertilizer does a lot of harm to the lakes. It got to the point where the water in the lake didn’t look like water. It was disgusting green thick water. People use the lakes to go have fun but when the water is full of algae it makes it really hard to have a fun time. You can’t go fishing and you can’t swim in a lake full of algae. It is very important for the government to step up and do something about it because the farmers aren’t going to give in easily. I believe that fertilizer should be restricted by the government and how much is being used. The reason being is because fertilizer contains phosphorus and that is what is causing the algae in the lakes, also it also causes dead zones around local ponds which is an area that has low oxygen. These are the most important reasons as to why fertilizer should be regulated because it is affecting the ecosystem and that affects us. I think that we should use fertilizer but to an extant, just because it does help our plants. By using to much can be dangerous and contaminate things. I think it’s beneficial because in one of the article it says,”Is used to enrich to organic matters in soil.”.This supports my arguments because it’s stating what it does and what farmers use it for. I believe that the U.S. Government shouldn’t restrict fertilizer Use to improve water quality. I think that because in the article it states that “Fertilizer provides the elements that the plants use in order to make them grow faster, better, and healthier.” These supporting details supporting my argument are important because I believe Fertilizers can provide a benefit to fertilizers that are merely nutrients applied to cultivated fields to increase required elements found naturally in the soil. I believe that the U.S. government should Restrict Fertilizer Use To improve water quality. The fertilizer contaminates freshwater and can ruin an area’s ecosystem. Also, it makes the lake waters green and cloudy of Algae. That then means the algae die and decompose, the water is depleted of oxygen for fish and other species. Another harmful effect of the algal blooms due to fertilizer runoff is that the algae covers the surface of the water making it harder for sunlight to penetrate and reducing the ability of underwater plants to perform photosynthesis. The US Government should restrict fertilizer to improve the water. The need to put restrictions because the water will be affecting everybody else, the people were banned for using tap water for to days. They details are important because it shows that risks dont only go to the farmers, they need to put other people into consideration. The U.S. Government should not have stricter ways to use fertilizer to improve water quality. Not only is it the fertilizer, it could be the live stock and sewage. The farmers know what they are doing and they know what to use and how much to use so it is not just them. Also since this is looked at as a big issue, some of the components will fix themselves to human error will be all that’s left. I believe we should restrict fertilizer to improve our water quality. The lake is filled with algae which is affecting many people around it. People couldn’t even use their tap water since there was too much algae. The lake was pretty much made up of algae since the algae was consuming the water leaving the lake to look like green pudgy. Although fertilizer is very helpful towards our plants, out health is on the line due to this much algae. I think that the U.S. government should regulate fertilizer because the cons outweigh the pros for this issue. Fertilizer causes rapid growth of algae in bodies of water and this algae can kill fish, birds, and other mammals. Fertilizers produce pollution and contaminate freshwater. Farmers could actually loose crops from using too much fertilizer so instead of helping their plants, they are damaging them. Fertilizer is like steroids for plants because it makes them grow fast and fuller but it is damaging the soil by making it depleted of nutrients. The U.S Government should restrict the use of fertilizer so our water quality could improve. The use of fertilizer affects all of our health and animal life. Using fertilizer makes the water in lakes to grow algae I know people would want to go out and be able to enjoy passing time at a lake without algae in the water. Not only that, but it also cost too much. All of these things should not be happening just because we are using fertilizers and also when there are other alternatives. I agree that the U.S. government should restrict fertilizer because it makes the water not look like water anymore. In the article nearly half a million people were banned from using tap water in Ohio. It’s just the beginning of what can happen if changes don’t happen. I am on the con side because it is affecting our water. It is affecting people and livestock because the water is not clean. The water is turning green and cloudy and isn’t safe to use. Nearly half a million people in Ohio couldn’t use or drink their tap water. I think that the government should not restrict fertilizer usage. Fertilizer isn’t the only factor leading to the pollution that Lake Erie is seeing today. NPR News states, “There is growing concern that the algae are feeding off of other sources, too, such as runoff from livestock and sewage.” With that being said, the government would be wise to just focus on the runoff into the lake. Perhaps placing concrete structures or diverting runoff to other areas will greater reduce the pollution than just attacking one source. If we really want to protect Lake Erie banning fertilizer is not the answer. The government should not regulated the farmers use of fertilizers. The fertilizers that farmers use run off into the lakes and open waters and causes algae build up. This will causes the water source to be contaminated and the people are not about to use tap water from that water source. This also makes it a problems with the community because it’s taking the open waters away from the people so they can’t swim or enjoy the water. I do not believe that not using fertilizer will save the Toledo residents of unusable tap water. This is because other sources of contamination are also causing the algae infested lake. Even with farmers using less fertilizer the lake remains the same. Farmers should be able to fertilize the crops how they please. I think the government should restrict fertilizer from these farms because the farms could grow the crops without the fertilizer. If the government restricts it will benefit the farms because they will be saving money. I also think that the fertilizer is destroying our environment. It is killing fish because it taking away the oxygen from the water. It also could kill humans because if a human eats some of the fish in that contaminated water. I believe the government shouldn’t need to restrict fertilizer use. Fertilizer runoff is not the only problem causing algae growth. Things like livestock runoff and sewage are also causing these problems. Though farmers should try to limit the amount that they use. Farmers wouldn’t be able to get as much out of their crops, meaning people wouldn’t be able to get the food they would’ve been able to get. 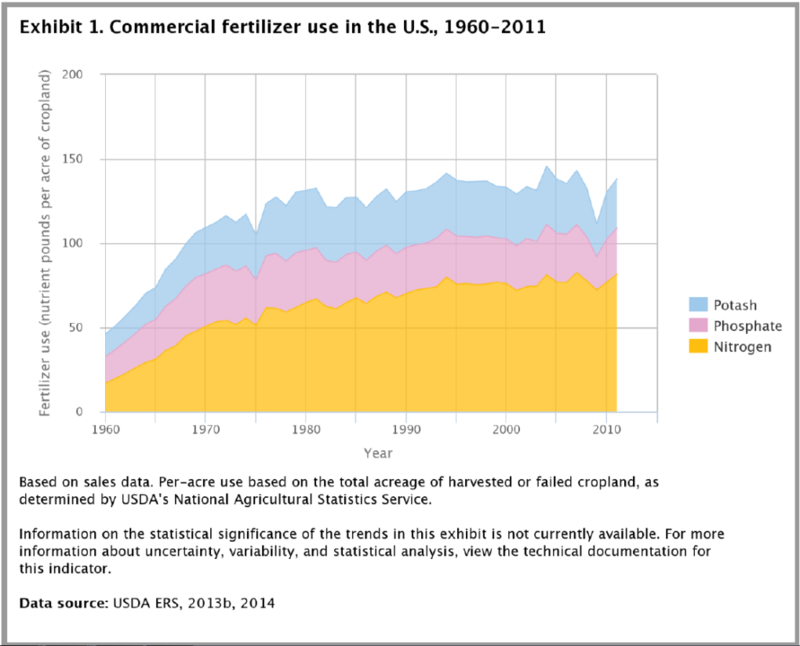 The U.S. government should restrict fertilizer use to improve water quality. Fertilizer is often overused, causing more runoff into bodies of water. Because of the elements used in artificial fertilizers, working together, these cause algae’s quick growth in water, making water unsanitary to drink and unsanitary for life. I feel that these supporting details are important to my argument because while fertilizer is helpful in growing crops, there are alternatives, or people could simply use less of it. This would be accomplished by the government restriction. Furthermore, fish and more are also food sources that diminish because of fertilizer. Water is also needed to live, but if it is not healthy to drink, then we would quickly run out of water and/or lose our health. I think that the farmers should regulate the amount of fertilizers they use, the amount of fertilizers they are using are causing problems in the environment. If they regulate the amount of fertilizer they use, it could benefit the farmer because they end up using less and it can save them money. The overuse of fertilizer causes Eutrophication, making the algae in the water grow at a rapid pace, this then leads to the water becoming green and cloudy. If the water is green and cloudy, this doesn’t allow sunlight to penetrate through. This leads to some of the underwater plants unable to perform photosynthesis, with plants unable to perform photosynthesis it ends up killing them off. Therefore, fertilizers are killing off underwater ecosystems, if they regulated the amount of fertilizer they used it could benefit both the farmers and the environment. I think the U.S government should restrict fertilizer being used to better our water quality because yes the fertilizer helps plants grow healthier but fertilizer is doing more harm to us and the animals than anything. The over-usage of fertilizer is what adds onto the unhealthiness of this product. If fertilizer was restricted, we would see a big difference to our water supplies. I think the government should control the fertilizer farmers use, but not drastically lower the limit. Fertilizer is not the only cause of the algae in the water. In the text it said that the algae is feeding off livestock and sewage. I say that the united states should get rid of use of fertilizer and figure out another way to make the plants grow faster. Considering we are in a drought we need as much clean water as we can. The contaminated water can kill other animals. The fertilizer problem affecting our natural water resources need to stop. The government needs to regulate the laws on those who do use fertilizer to help their crops. Although, fertilizer helps increase the yield and growth of crops, fertilizers are very expensive and are often over applied, leading to the pollution into our water supply. Like in lake Erie, there is excess amounts of algae that blocks the sun rays from reaching the bottom and letting the plants form correctly. The algae also can release toxins and derive the water from necessary oxygen. The fertilization needs to be some sort of regulations and who can use fertilizer and how much can be used to stop the pollution in our waters. I think the government shouldn’t have control on the restrict fertilizer. I think that because if they restrict the access to the resources that farmers need. But fertilizers are what helps and gives the plants nutrients and it makes the plant grow much healthier. I also think that fertilizers tend to go for because it what helps the plants grow much better.